Mr. 7 had his first baseball game the other night. He’s been looking forward to this for weeks, nay, months – we’ve been practicing grounders, pop-ups, batting and catching so much that my arm is sore just thinking about it. This story isn’t about Mr. 7’s enthusiasm however, it’s a story about his mom and part of why I respect her so much. It’s an hour before the big game. The kids and I have some snack, then go to the backyard to warm up. Little Ms. 2 plays on the swing set, Mr. 4 practices batting with a whiffle ball, and Mr. 7 breaks out his pro-style bat & ball. Before we can begin however, he runs upstairs and changes into his spiffy new uniform. He looks great. 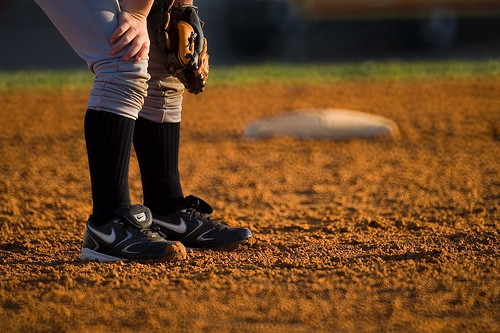 The skill he wants to practice most this day is something I call Wild Ball – a game where I throw pop-ups that force him to run and dive for a catch. He loves the challenge, and always gives it his all. Needless to say, his spiffy new pants get dirt and grass stains all over his knees. Now for Mr. 7 and I, that’s actually a good thing. We joke and say he’s got “fun” all over his pants, because getting a little dirt on your clothes usually indicates that you’re having an awesome time outside. For Mrs. Mom, that is not the case. Fast forward an hour later, and Mrs. Mom comes outside to see Mr. 7’s spiffy baseball uniform already dirty. She’s visibly upset, and I’m surprised. It hadn’t occurred to me that she would mind his dirty knees, which was a real oversight on my part. I immediately apologize and take responsibility for the sullied uniform. Mrs. Mom takes a deep breath, smiles and says No, it’s alright, I’m a little OCD about these things. The moment passes, everything is ok, and we go inside to get ready for the game. Why am I regaling you with this story? Because it’s a beautiful example of practicing with our emotions. It’s not easy to feel anger or frustration arise, and not get completely swept away by it. Mrs. Mom saw something that upset her, and instead of reacting from that emotion she took the moment she needed to respond from a more constructive place. Mrs. Mom did not let this disappointment ruin her mood, Mr. 7 went on to play a fantastic baseball game, and we had a great evening. It may seem like a small thing, but as an educator let me tell you – responding instead of reacting is the practice of superheroes. It’s hard to do, not always possible, yet is always worth the effort. I salute every parent and educator who makes this a conscious practice.